To understand how an empath connects to metaphysical realities, it might be a good idea to perceive this universe as a multi dimensional phenomenon, with varied frequencies pulsating at different levels and speeds. We have the material world, with its plant, elemental and animal kingdoms which science can explain with some degree of certainty. We then have the invisible worlds that vibrate on higher, or as the case might be, lower frequencies and in those invisible worlds’ diverse laws and truths govern. These invisible worlds are made up of “atomic” or “quantum” realities, and to decipher them is far more complex. The question is can a psychic perceive them? The answer is yes, may be because these diverse frequencies emanate through a giant psychic switchboard that clairvoyants tune into. Indeed, the gift of psychic perception is a capacity to move between frequency levels and parallel universes with ease, connecting correct sources of metaphysical information via the psychic switchboard. Kaku is a renowned Professor of Theoretical Physics at the University of New York. He actually talks about the “physics of the impossible”. To Michio Kaku a psychic switchboard could indeed become a reality we can already pop a micro chip into an individual’s brain and have connect it to a computer! For example, Kaku reported on an experiment done on a stroke victim. A chip was put in their brain to stimulate blocked mental activities and the stroke victim was then able to answer emails and surf the web as a result. The computerization of human thought is therefore possible. Kaku believes that in less than a hundred of years we could even switch timelines. In other words, those “seemingly” unreal science fiction plots on the silver screen, such as films like “Back to the Future”, are far more possible than we currently imagine. An MRI scan can already pick up thinking patterns by projecting them on a screen. The fact is your brain lights up like a Christmas tree if you tell a lie on that MRI scan! So it is clear that science could eventually decipher emotional patterns or create a computerized dictionary of thought, hopefully for the betterment of humanity. Therefore, if one were to perceive the human brain as an instrument that receives and emanates energy formulations, we will understand how science can already screen and computerize its activities. As we said, Michio Kaku concludes that the universe we live in is not just one. He often repeats the theory that there are diverse parallel universes, each containing multifaceted realities. 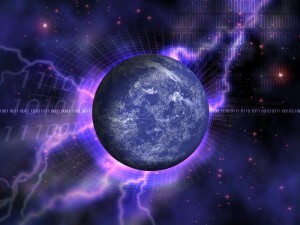 Perhaps when a clairvoyant tunes into that “switchboard”, she is able to tune into the frequencies of those universes? Something to think about anyway.